The latest technology that will revolutionise the way we work is now upon us. It is called unified communications and it is a principle that strikes at the very heart of this new world of fragmented yet interconnected work. It is a comparatively straightforward idea intended to solve a complex challenge. As organisations have started to adapt to an economy that is always-on, global and without boundaries of time and space, they have looked for ways to integrate technology to deliver a better working experience for employees, reduce costs both for themselves and their clients and improve their competitiveness. 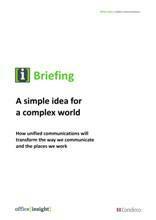 The Briefing can be downloaded here.